The frequency of convenience stores can be explained by their, well, convenience, and their neighborly attitude. After so many fetchings of black bread, you get to know your local magazin workers, and it’s not rare to ask to zapisat, or write a purchase in the store’s ledger so that you can pay for it later. Where I come from, the pharmacy is a big-box corporate affair, with row after row of deodorants and toothbrushes. 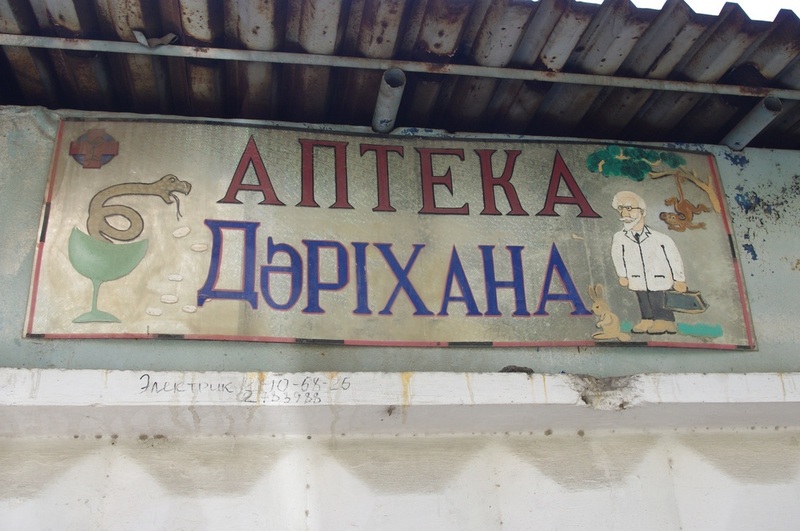 The Almaty pharmacy, or apteka, is way more intimate. Boxes of pills and tinctures are kept behind glass, and you have to ask the pharmacist to pull what you want off the shelf, a reasonable safety measure that still reminds me of the Soviet-era format for consumption, where you submitted your shopping list to a cashier and they ran and got you what you needed. Depending on how you look at it, it feels like either an invasion of privacy (does the pharmacist really need to know about my diarrhea?) or a service that’s refreshingly personalized (I’ve gone into an apteka before and told them I had a sore throat, and instead of giving me any medicine they sent me home with a recipe for hot milk and honey). Like with the magazin, the apteka’s frequency is determined most of all by its convenience. A lot of consumer products are driven by simple facts of life. People will always need to eat, and they will always get sick, so Almaty will always have lots of magazins and aptekas. I heard, by the way, that many pharmacies are owned by Koreans. What’s up with that? Every culture has its own standards of beauty, and I would say that Almaty girls are held to an unusually high standard. There’s a common trope, for instance, about girls putting on their heels and mascara just for a trip to the apteka down the street. 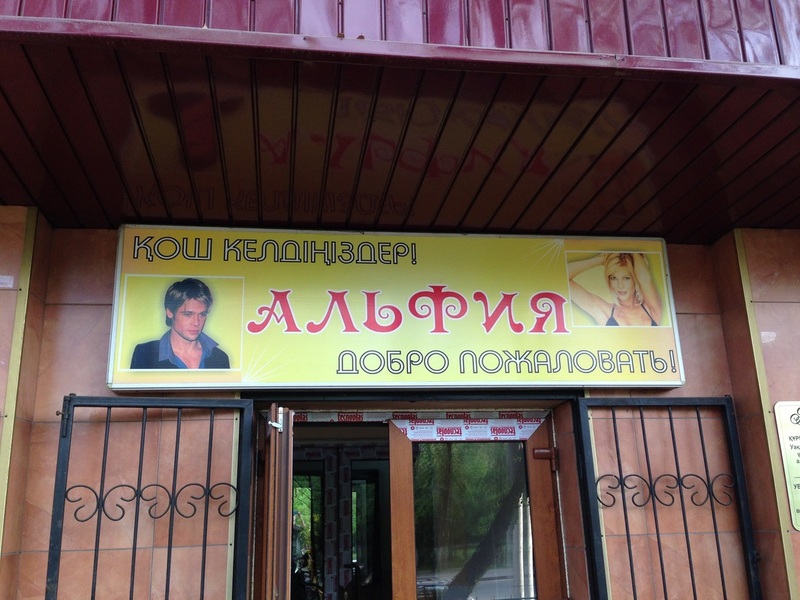 Suffice it to say that gender roles in Kazakhstani society are especially well-defined, and the beauty salon, or salon krasoty, is where women can go to refine their femininity. I have a far-out theory that the frequency of the salon krasoty is driven in part by a madness for hair dye. Kazakh girls mostly have black hair, but most seem to find this too plain and dye it imperceptible shades of brown, and many visitors are quick to notice the psychedelic shades of orange and purple seen in the curly hairdos of local Russian babushkas. But a more likely reason for their frequency is their low overhead. In theory all you need is a roof, a chair and a pair of scissors and you’re off, so the barriers to entry in the salon krasoty market are easily surmountable. If having a beauty salon on every block tells you something about a society’s gender roles, then having a notary on every block must tell you about how a society does business. The bureacratic nature of Post-Soviet states, after all, is notorious. Ha! Excuse me for the bilingual pun, as notary’s are called notarius in Russian; a friend and I used to sing “No- no- notarius!,” a la Biggie Smalls, every time we passed a notary. Needless to say we had to sing it a lot. Notarization is required for most government documents, so you can find little “notary villages” clumped around every TsON, the government’s one-stop shop for paperwork. 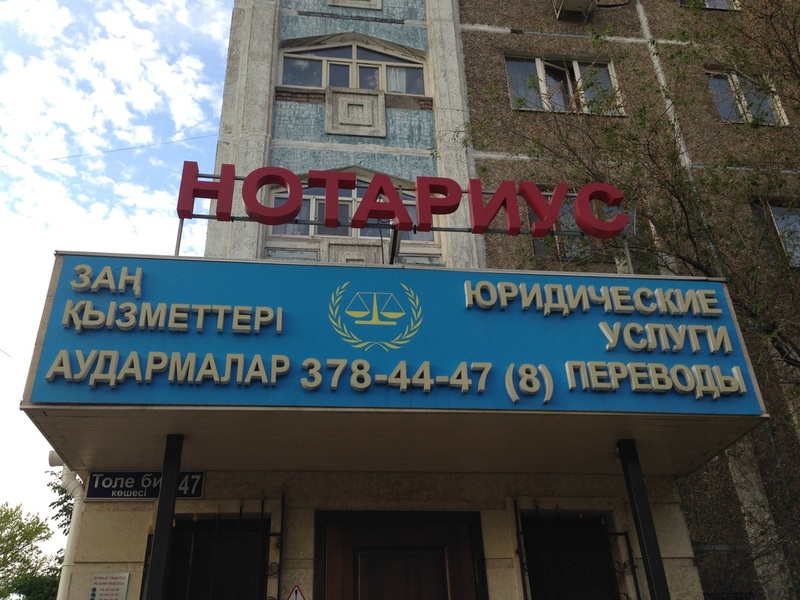 Why notarized documents are required more in Kazakhstan than say, the US, should be explained by a scholar in comparative legal systems, which I certainly am not. I’m waiting for your answers! 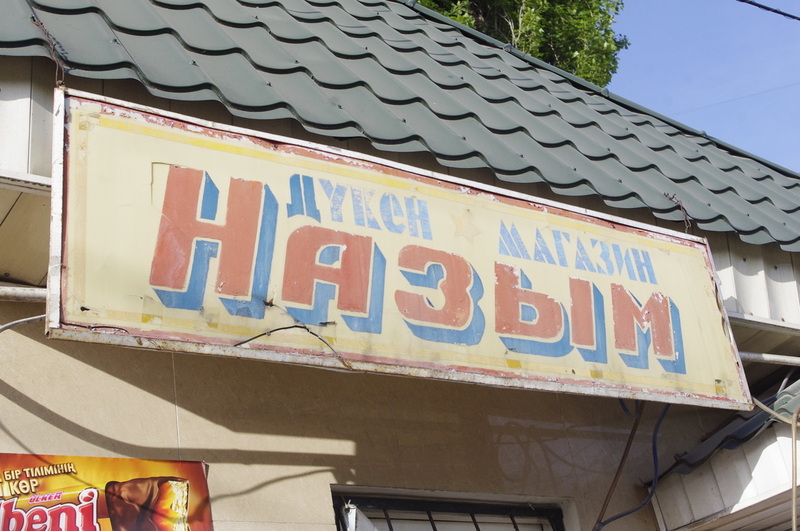 Central Asians have become famous for their golden teeth, a hangover from Soviet dentistry, but visiting Almaty you wouldn’t be blamed for thinking that you’ve come upon a city full of floss-obsessed teeth worshippers. 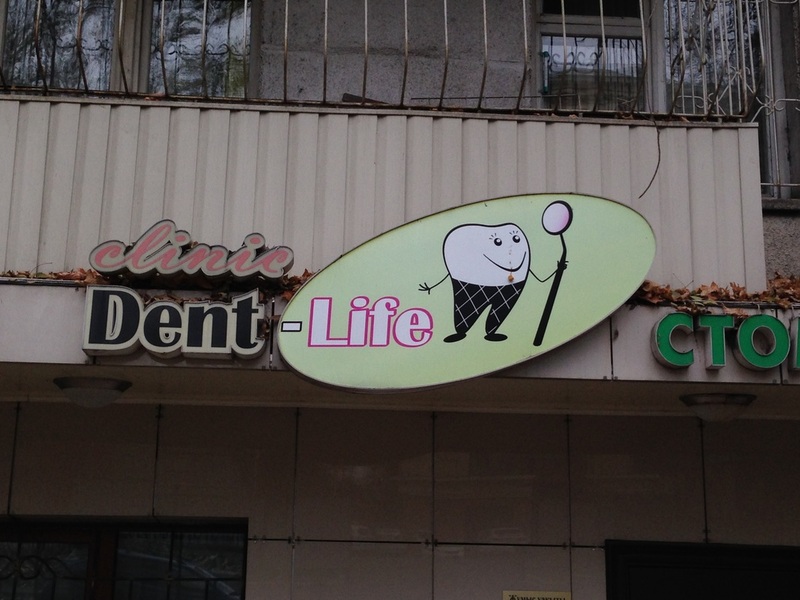 Dental clinics are everywhere, and most have cute logos of anthropomorphized teeth. Which raises the question: If teeth can smile, do their teeth have teeth too? Is it teeth all the way down? Most health care in Kazakhstan is socialized and totally free, but dental care is not included. As a result, private dental clinics have sprung over all over the city. 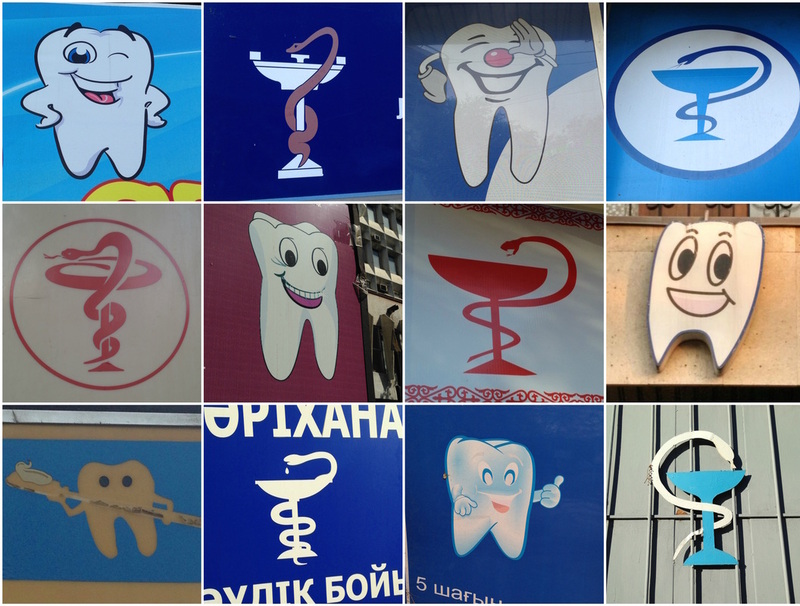 I also imagine that medical students, seeing the shockingly low wages of doctors and surgeons in Kazakhstan, realize that dentistry is a more profitable field and go on to open up their own centers, hence all the teeth-with-teeth on back-lit signs throughout Almaty. Back in California, we also have plenty of dentists and beauty salons, but cobblers? Now that was a new one. Don’t shoe repair places seem a little old-fashioned? Perhaps that’s because they’re associated with the hand-made economy of yore, when every pair of shoes was more precious and you’d try to get every last mile out of them. These days, the demands of consumerism require us to shuck our shoes for a new pair whenever they get too scruffed up. 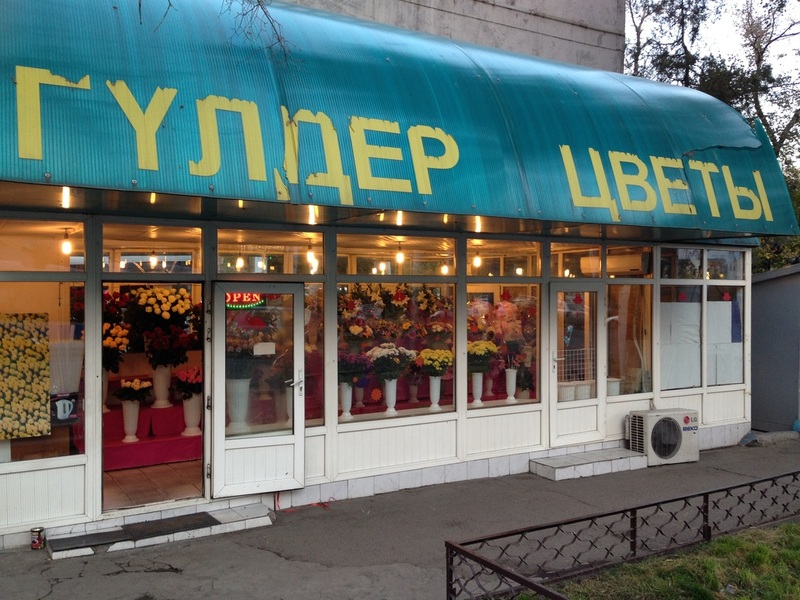 In Almaty, there’s a deep-rooted thriftiness that counterbalances the consumerism, and maybe that’s why there’s a shoe repair shop every few blocks. In the Soviet period, shoes were often a deficit good, so you may have had to patch and sew the shoes you had until you got lucky enough to snag a new pair. A lot of the shoe repair places in town certainly seem like relics of this era, what with their retro signage and no-frills service. I’d also note that Almaty’s sidewalks and streets aren’t always the best maintained, and all those cracks and ripples make for more wear and tear. This is especially true for high heels, every Almatinka’s favorite accessory. 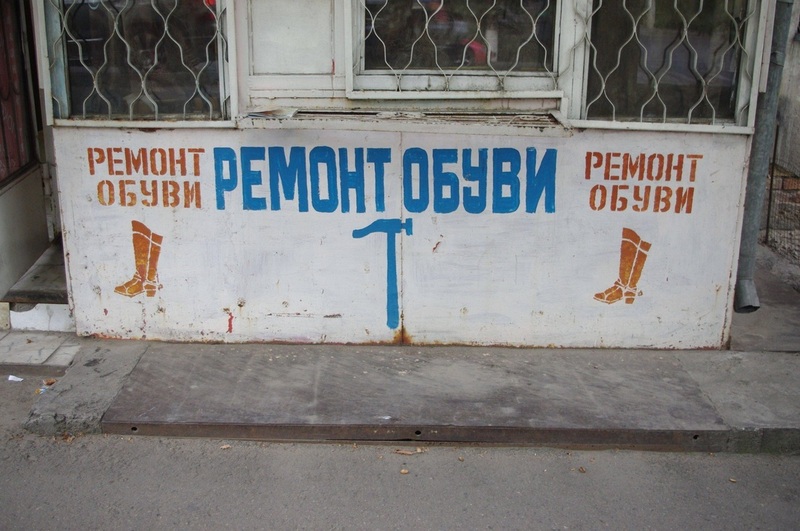 A lot of the business that shoe repair places do, I hear, is selling heel tips [набойки; naboiki] for when your stilettos get chipped away. 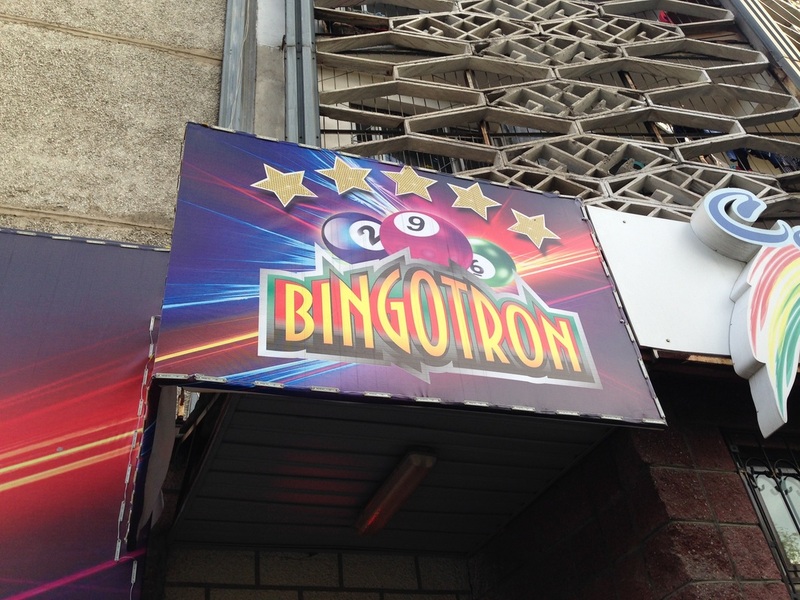 I first came to terms with Almaty’s gambling problem when, stuck without a working computer, I once went looking for an internet cafe. I found a place that advertised itself as such, but wait - its facade was covered in clipart of gold bullion, and when I went inside, I found that every other person there was playing roulette online. I had no choice but to sit down and sheepishly check my mail, surrounded by chain smokers. What was going on? ​Later I’d realize that there weren’t just faux internet cafes everywhere, but bookmakers, and bingo places, and even touch-screen bingo machines inside magaziny. This was basically gambling-lite, because the big casinos had all been kicked out of Almaty and sent to a reservoir town called Kapshagai an hour outside of town. The president, apparently, had an idea to make a gambling oasis for high-rolling Chinese, and so the government restricted casinos to operating in special zones. Kaz Vegas, as some call it, has yet to draw the intended crowds, but it’s left a trail of pseudo-casinos in its wake. Could it really be a coincidence that so many pawn shops pop up near gambling joints? If you have a bad run, you just go next door and plop down your wedding ring. Perhaps the proliferation of pawn shops is also a symptom of a cash-strapped society, where the average salary is still around $500 a month, paychecks can arrive months late, and cars and homes are quietly financed with easy credit. 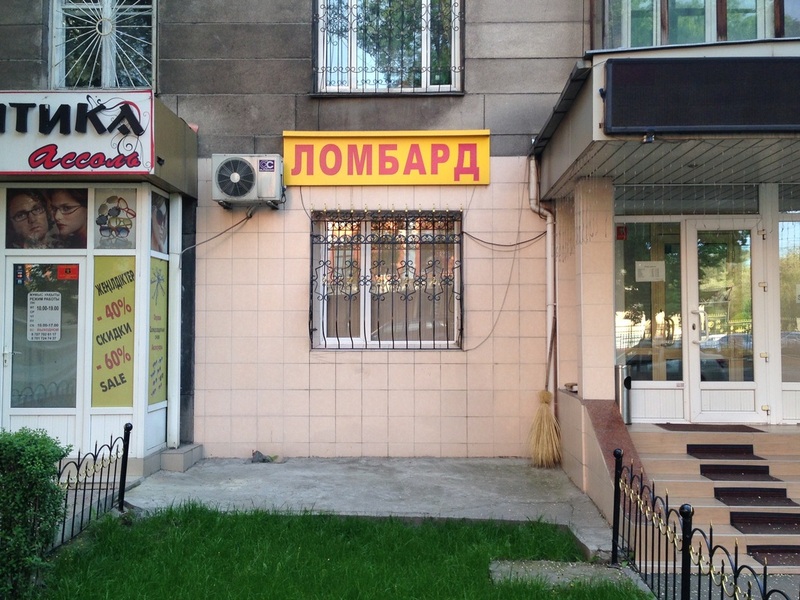 Lombards, as pawn shops are known in Russian, provide people with last-minute liquidity. The funny thing is I don't know anybody in Almaty who's ever used one. Have you? Speaking of financial woes, this was the year that the Kazakh tenge collapsed, and “devaluation” became the buzzword on every Almatian's tongue. People rushed to change their tenge to dollars, and they didn’t have to go far, because there’s an exchange place on every street! In some countries, you can only really exchange your money at the airport, and in China I know that you can only do it at the National Bank. 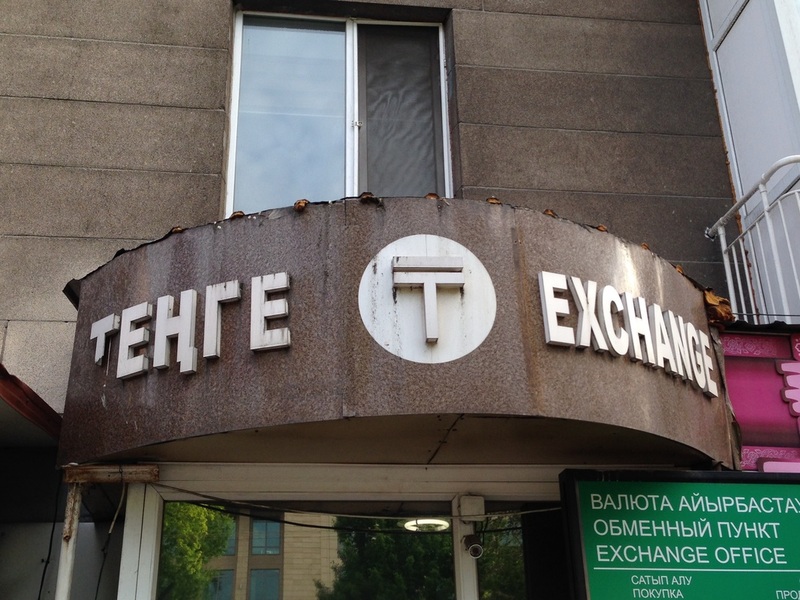 In Kazakhstan, private currency exchange places are a dime a dozen. All the currency fluctuations, and the fact that many sectors of the economy still run on US dollars, mean that these establishments are in unusually high demand. In the age of the internet, with booking.com and Trip Advisor easily accessible, it seems strange to me that so many Almatians still arrange their trips with travel agents. This is an industry that has long been dying out in the States, yet here there are travel agents everywhere you look, hawking trips to Turkey, Egypt and Malaysia. How do these people stay in business? Blame it on the putyovka. During the Soviet period, travelling abroad was a luxury reserved for powerful people, and everybody else got package tours, or putyovkas, to beach resorts in Sochi or Issyk Kul. These were provided by your workplace, and they were all-inclusive, with a hotel, food, medical treatments, you name it, all conveniently pre-arranged. Old habits die hard, and many people in Kazakhstan still prefer this kind of hand-holding. 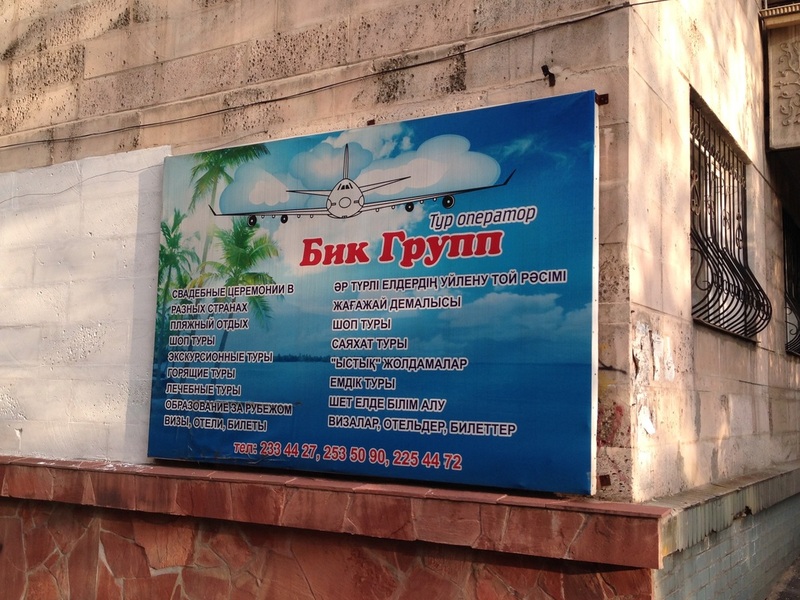 It’s true, also, that these travel agents can somehow sniff out some crazy deals. I regularly hear of people flying to Turkey, drinking a week away, and coming back with their pockets just a few hundred bucks lighter. Not bad for a service I thought of as obsolescent! Unlike some of the other items on the list, this last establishment is one that I can’t snobbishly scoff at. After all, if a city is overflowing with flower shops, it means its citizens are either botany enthusiasts or hopeless romantics, neither of which would be a bad thing. In the case of Almaty, both hypotheses might be true. People here certainly love gardens and houseplants and windowsill cacti. They’re also fond of old-fashioned courtship, and buying a bouquet for your sweetheart is more of an expectation than a surprising gesture. Now, why some places are open 24/7 is still somewhat of a mystery to me. Is it for badly-behaving drunks who beg for late-night forgiveness? Are savvy flower-lovers showing up before dawn to get the earliest shipment of Dutch tulips? I don’t know. Write me a message and help me solve this mystery, and let me know what other items I should add to this list!